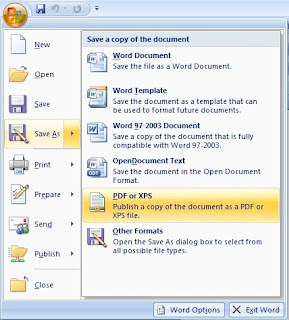 If you’re working with Microsoft Office 2007 you can make use of its additional functions that will convert your file to PDF format. This add-ins is sometimes not pre-installed on your Office 2007, you need to download it online via Microsoft website and then run it on your computer then click install. So if you want to convert your Microsoft Word 2007, Excel 2007 and PowerPoint 2007 without installing third party software you can simply follow the few steps below to have this Save As PDF option on your MS Office. In our previous article we’re talking about How To Put Password in Microsoft Word 2007, Excel 2007 and PowerPoint 2007 securing your documents from being edited. 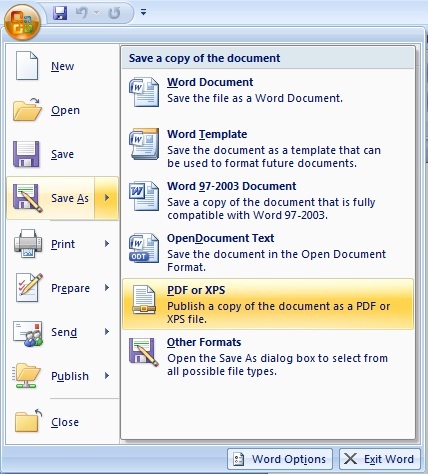 Save as PDF options is simple way of securing your document from alterations and editing. This is useful where your dealing with amounts and other calculation related matter document, saving it to PDF would be the best option as you will be the only one to hold the original file. 1. Just download the add in here: 2007 Microsoft Office Add-in: Microsoft Save as PDF or XPS . 2. Download the file by clicking the Download button and save the file to your hard disk. 4. Follow the screen instruction to complete the install. 5. When installation is done you can now see the Save As PDF and XPS options. Doing this process and installing this add-in is another tip you can use for use MS Office 2007. Though their other Word to PDF converter online this option is still the best and easiest way to use for this purpose. You don’t need to pay as this add in is free, just make sure that you’re using the original and licensed copy of Office 2007.